Picking a fight with a comic strip? Yup. And xkcd, at that. 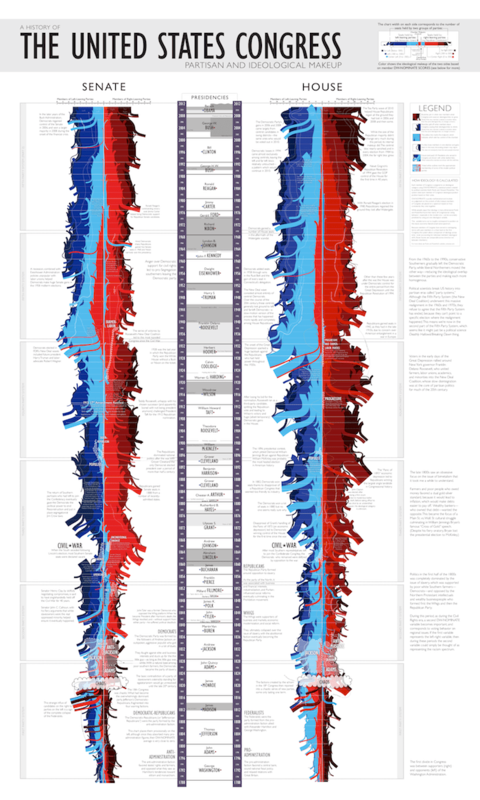 Randall Munroe has done a superb job creating vertical time lines for the House and Senate, showing the ebb and flow of different parties. Look here, it’s really cool. But left and right change meaning over time. Different place, different time, different context. The slaveholders were to the left and the abolitionists to the right? Whoa, Nelly, er Randall. In today’s context, the Republicans are on the right. But the party once was home to advocates of public education, sufferage, abolition, and temperance (hmm, temperance? just ignore that). Munroe really did make a cool chart. And he gets lots of things right. I hope he fixes the chart. ← Do Great Circles Wiggle? Originally I thought he had incorporated the historical right-left swap (the text seems to indicate so) but now I see based on where people are placed he didn’t. It’s very tricky, though; I don’t think there’s much a comparison with modern right-left tendencies no matter how you arrange it. When (for example) the major issue of the late 19th century is whether to use the gold or silver standard (and the “greenbackers” are considered the looney nuts), politics becomes a different set of axes altogether.